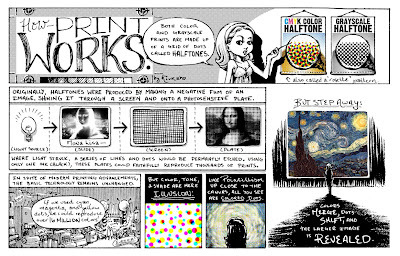 Comic Tools Reader , cartoonist extraordinaire, and fellow online tutorialist Rivkah is starting a series of comics teaching about print. I know my pre-press pretty well, and I pride myself on sending files to my publishers that get compliments (scanning is an upcoming multi-part Comic Tools lesson, in fact), but I don't really have much knowledge of print. Rivkah ran a publishing company and knows this stuff inside and out, so I'll be posting her lessons here as they come out. I've already learned stuff I didn't know just in this introductory comic. These will get pretty intense, so strap in. Really awesome! This does seem like a great info. I truly like your hard work; this is almost useful information for us.